oil (I used olive) — or dripping if you want to be traditional! Preheat the oven to 170C. 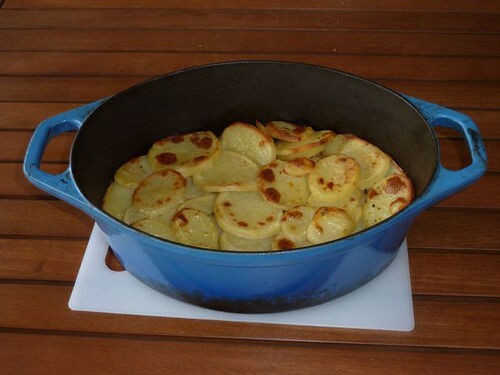 Use a heavy casserole for this (a Le Creuset is ideal). Heat the oil or dripping, and brown the cubed pork. Remove and set aside. Then fry the onion and garlic until softened. Return the pork to the pan, season with salt and pepper and add the herbs and juniper berries. Add the prunes, then scatter over the apple slices and sprinkle lightly with sugar. Finally, cover with a layer of overlapping potato slices. Add more salt and pepper, pour in the cider, and then dot with butter (or drizzle over a bit of olive oil). Cover and bake for about an hour and a half. Then remove the lid and check the potatoes are cooked — if not, raise the heat to about 200 C and cook uncovered for a bit longer. Otherwise, brown the potatoes under a hot grill. Serve with a green vegetable. The recipe that was available at Waitrose for sausage caserole is in the Frugal book and I had forgotten how good it is. It’s a real period piece, isn’t it? 🙂 Now you mention it, I haven’t seen any duck here. Very much cow, sheep, and pig country! I’ve just bought a lovely new Spanish cookbook (by Jose Pizarro) so will be trying some new recipes soon! Hi Janice and thanks for commenting! 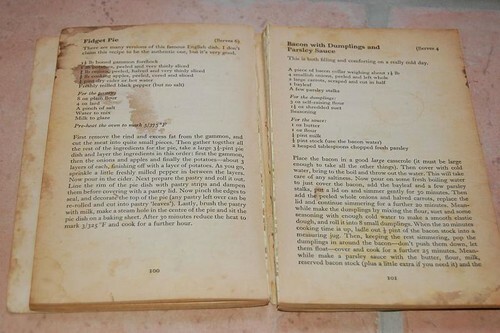 Yes, despite its age there are some recipes here that are worth rediscovering. still got my frugal food cookbook and how to cheat at cooking and very well used since I was given it for a birthday present as a penniless student nurse in 1974. I used to make the pork rissoles at a local pub in New Zealand when I was a cook for a year. They were a huge success, in the largely farming community. Even the tourists loved them. 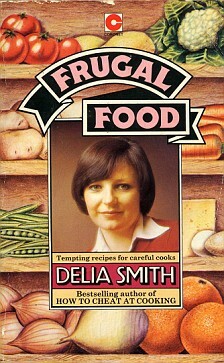 Delia is to English cooking as the union jack is. She brought good old fashioned cooking back into vogue and I for one adore her honesty and simplicity in her cooking. Who can afford the fancy foods that are cooked on TV these days. All those towers of smidgens of carrot and 1 pea and 2 drops of sauce. What happened to good old gravy? haha, I know what you mean Stephanie 🙂 Those restaurant dishes look good in their place, but at home? ?